Thread: Any New Year's Resolutions? Yeah, I know they're ghey and most people drop them in a few weeks, but I really believe in at least trying to start new years of my life on a good foot. So I usually try to make at least one new years resolution and give it real effort (so it lasts a few months, not weeks, 555). One thing I've found that helps is making them quite specific, rather than keeping them general or nebulous or concept based. So, instead of something like "I'm going to lose weight" or "I'll improve my relationship" or "do better with money", I'll do things like "join gym, workout at 9am daily, reduce to 2000 calories a day" or "buy a r/ship program to do with s/o, commit wednesday nights to just doing something fun together" or "save $200/week, put in self directed retirement acct". So my big one this year will be no alcohol. All year. And make a Vblog about it, where I check in once per month for 3-5 minutes and talk about not drinking in a place where drinking is pretty much an integral part of the social fabric. Anyone else out there planning on changing anything in the coming new year??? I will never give up alcohol......that's for damn sure!! Here's my resolution....to never make another one. Mines to get strong enough to do a muscle up on gymnastic rings. Not exactly new year resolution as it was my birthday goal but since my bday was only a month ago can have it as a new year resolution too. They are so difficult. My resolution is to die in a fiery automobile crash. The whole point of NYR's are to list the things you're going to spend the year studiously avoiding. I just did a 6 mile walk down the Thames path from Surbiton to Richmond finishing up in the Roebuck on Richmond Hill for a deserved pint. That walk and this view just wouldn't be the same with a Appletiser. Amazing weather to finish off the year. LivinLOS, nelsonone, Robaht and 1 others like this. I havent actually drank in a week and I feel pretty good tonight. 2016 is going to be great year for me and I am genuinely excited for it all. Hard work, yes, but life changing. Been sitting here before going out, listening to the pump-up music and thinking about the cool things of 2015, but also smiling over what 2016 is gonna hold. We have a group of us going down to the river for grub and good times... most of the group will be drinking, but I wont. I am feeling good enough already, honestly. Last edited by WarProfiteer; 31st December 2015 at 20:43. I tend to do the opposite of specific and just pick a few general small things that I'd like to change, the key here is like to change so it's something I want to do and it's a change not give up so it could be more of something and less of something else. This year is less checking the internet on the phone and try cook some new things, preferably Asian. I was reading a Chinese takeaway menu earlier in anticipation of finishing off the year with one and was positively salivating looking up the different dishes but unfortunately they were closed so it's pizza and chips this evening! WarProfiteer and LivinLOS like this. I'm starting with a sugar free January, still having natural fruit sugars though, and aiming to hit the gym to get a decent beach bod for my trip in April. Well, should anyone here ever find themselves in Chiang Mai for a NYE, going down to the riverside area is a far better choice than going to the main square downtown (Thapae Gate). I've been to the gate twice in the past.. usually a concert going on and lots of street vendors, then huge fireworks at midnight. It's fun, but you are directly beneath the fireworks display so you're looking straight up to see them, which is an odd angle. Down by the river, it's way less shoulder-shoulder... plenty of room, so you dont feel mobbed... not much street food, but we grabbed drinks from 7-11 after hitting The Red Lion Pub for a late meal... fireworks all up and down the river, several displays at once. I'm generally 'meh' about fireworks, but it really did seem pretty cool... almost overwhelming there were so many multiple displays all going off in close proximity. I would really like to try that.. Depend how extreme you go looking tho as theres added sugars in almost everything processed. Go take your crazy train somewhere else !! 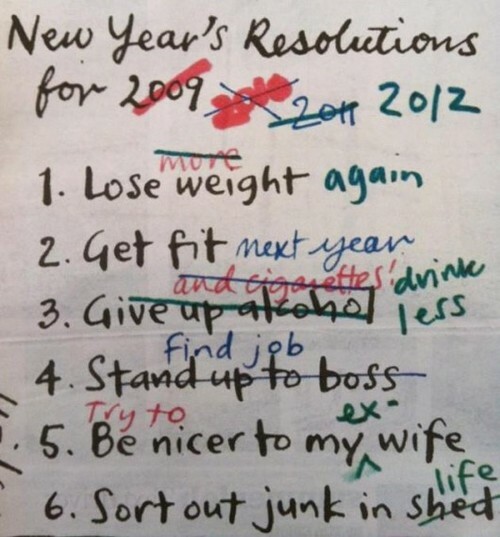 I mean theres resolutions and just insanity !! WarProfiteer, Dkdude and Robaht like this.